Easter is fast approaching. I've been making and testing Healthy Carrot Cake Recipes like it's my job (which it should be... because that sounds like a delicious job). A few years ago, around this time, I was nannying and you would have found me madly rushing through Kmart and craft stores for different craft projects to fill in some time during the day with the kids I nannied. Whilst I'm not nannying anymore, I love coming up with different projects - and this is one I thought I'd share with you for Easter. 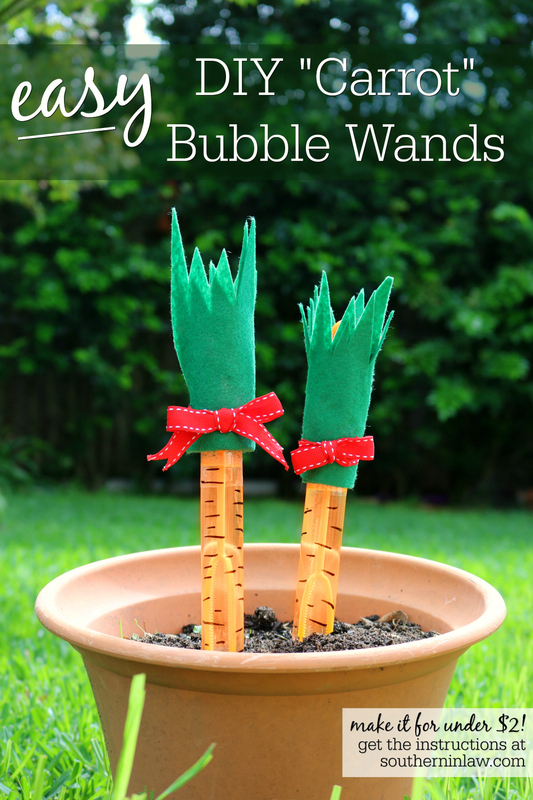 These "Carrot" Bubble Wands are a super cute gift idea or party favour - and they are so cheap and easy to make. We made ours for around $1 each - and making them only took a few minutes! Orange Bubble Wands - we bought ours from Kmart for $0.75 each. Next you want to cut out your "grass"/"carrot tops". I didn't use a pattern for this - simply cutting my A4 sheet of felt in half and then chopping triangles to make the right shape. Next you've got to attach your carrot tops! You can either secure them with a few stitches with needle and thread - or with a small safety pin. We also tried hot glue, however, that was a litle bit fiddly. All you have left to do is tie your bow and you're good to go! To style them, pop them all in a pretty basket - or display them in a pot. Instead of using actual dirt, you could pop these into a pot with some florist's block and cover the top with brown fabric. Or shredded green paper "grass". But tell me, are you a craft fan? What was your last craft project? And what's your favourite holiday? I'm a Christmas girl - but Easter comes in at a very close second!